Several companies are already in the business of winning that piece of real-estate on your wrist, courtesy of Android Wear. One of them in particular, Asus, is hoping to entice consumers with its attractive ZenWatch - one of the latest entrants in the Android Wear space. Adorned with a $199 cost, it’s undoubtedly one of the more competitively priced models that are available right now, but does it have enough goodies to really differentiate itself from the motley crew we’re exposed to already? Asus isn’t a stranger to meticulous designs - they’ve taken great pride in really being attentive when crafting its products. With that in mind, it’s not all that surprising to find the Asus ZenWatch is receiving that same level of premium craftsmanship we see in some of its high-end products. Quite simply, the ZenWatch is arguably the best looking Android Wear smartwatch at the moment. Why’s that you ask? Well, it has that perfect mixture of premium quality materials and a solid foundation with its construction. Circular watches have been the rage of late, evident by recent entrants like the Moto 360 and LG G Watch R, but the Asus ZenWatch makes square shaped watches hip once again. Out of everything, its attractive quality is pronounced thanks to the rose-gold-colored band that’s sandwiched in between two steel layers, which is the foundation of the casing. From a cursory look, the casing appears almost flat, but there’s a subtle curve to it that contours nicely along our wrist. We can certainly say that the design is clean, one that doesn’t have any sort of buttons, crowns, or anything else to mesh with its slick lines. 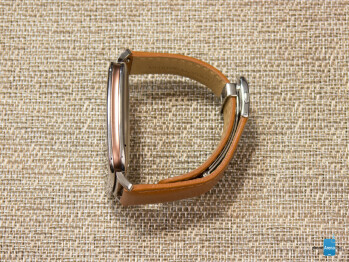 In fact, the only things that break up its design are all found in the underside of the ZenWatch – they include the pin connections, screws, and single power button. We know, it’s something that’s common amongst smartwatches, but the charging process still requires us to utilize the included proprietary charging cradle. Needless to say, it would’ve been sweet to see this receive the same wireless charging treatment like the Moto 360. As for the strap itself, it’s a nice complement with its genuine stitched-leather material, but the clasp juts out to the point that it can sometimes get caught up or attached to articles of clothing. Thankfully, it uses the standard 22mm strap, which makes it incredibly easy to remove and replace it with another one. Style is undoubtedly plentiful with this one, but we can’t forget that the ZenWatch has a water resistant rating of IP55, which is good at protecting it from minor splashes and whatnot, but don’t expect to go diving beneath the water with it on. Smartwatches in general have this distinction of looking a bit too techy, like those calculator watches of yesterday (and even today), but the Asus ZenWatch’s pristine, elegant look elevates it to rival some of today’s sophisticated timepieces. We really have few complaints about its design, and in some way, it takes the crown away from the Moto 360 for being the best looking Android Wear smartwatch to date. Throw in its manageable size into the mix as well, and it certainly has the potential to appeal to both men and women who want to make a fashion statement. Specs-wise, the Asus ZenWatch doesn’t try to overstep its rivals at the moment, seeing that it sports a 1.63-inch 320 x 320 AMOLED display – similar to that of the display used by the Samsung Gear Live. Protected with curved Corning Gorilla Glass 3, it matches the subtle contour of the casing to give it a uniform, seamless finish. Trying to visualize things isn’t an issue thanks to its pixel density count of 278 ppi, so we’re able to read the time, notifications, messages, and much more with ease. Relying on an AMOLED screen, it bears all of the characteristics of the display technology – like its deep black color, wide viewing angles, and that iridescent glow in the dark. However, it’s still a bit tough to read out under direct sunlight, so we’re frequently using our other hand to shield it. For a square shaped display, the ZenWatch has enough likable qualities, but it doesn’t have that same level of appeal and attraction we get from the LG G Watch R’s circular screen. Depending on who you talk to, the uniform experience of Android Wear can be regarded as a good or bad thing. On one hand, it’s great that we’re given an easy transition with the Asus ZenWatch, since it runs the same experience as previous Android Wear smartwatches we’ve reviewed. Conversely, though, it means that there’s a lack of distinction between devices – so in a way, it can eventually manifest to a boring experience over time. 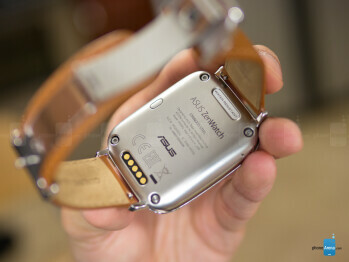 Interestingly enough, Asus tries to remedy that by introducing several features that accompany its ZenWatch Manager app. Once installed on our Android smartphone, it provides us access to features such as Asus ZenUI integration, Watch Unlock, Cover to Mute, Find My Phone, Find My Watch, Flashlight, Compass, and much more. Frankly, most of them aren’t all that new, but it’s still nonetheless nice to have access to them right from the onset. In addition, we can further enhance the ZenWatch’s functionality by downloading other compatible apps, like the Asus Remote Camera app, which as its name implies, allows the ZenWatch to act as a remote viewfinder for our smartphone’s camera. Not shockingly, too, there’s a wellness element attached to the Asus ZenWatch. Out of the box, it’s preloaded with the Asus Wellness and Up by Jawbone apps that combine together to present us with useful data and information pertaining to our lifestyle. Upon first inspection, we notice that there isn’t any sort of heart rate sensor incorporated into the ZenWatch, but instead, it relies on a different process to measure our pulse. Specifically, it obtains it by placing two fingers along the steel edges of the watch’s frame – where it most likely sends an electrical signal to measure our pulse. Going back to what matters the most for any watch, which is telling the time, we certainly appreciate the various watch faces that are available to us using the ZenWatch Manager app. Traditional ones like the Professional and Explorer watch faces provide us with classic layouts we’re familiar with – sprinkled with some useful data like battery level, steps taken, and temperature. Other watch faces, such as Sheen and Vigor, exude a more modern and lively layout. Even with all of the additional features Asus has stuffed along with the ZenWatch, it still pretty much looks, acts, and performs just like all the other Android Wear smartwatches we’ve seen. 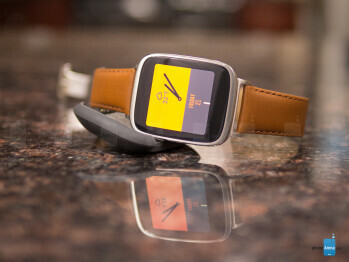 The Asus ZenWatch is powered by a 1.2GHz Qualcomm Snapdragon 400 chipset and 512MB of RAM. This configuration is capable of driving the software, and we stumbled upon no serious slowdowns or hiccups. That said, occasionally the frame rate drops a bit, and is noticeable by the trained eye, but performance is generally more than acceptable. As for internal storage, you'll have to make do with 4GB, as there's obviously no slot for a microSD card. That said, the way we see it – you're unlikely to need more than that anyway. 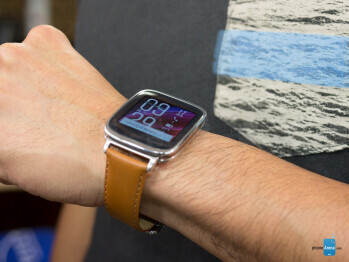 In standard fashion, the Asus ZenWatch’s usefulness is manifested once it’s connected to an Android 4.3 or higher device – without that, it’s pretty much like an ordinary digital watch. Naturally, the connection is established through the Bluetooth 4.0 module tucked inside of its body, which manages to retain a connection up to 30 feet away. You can't listen to music with the ZenWatch, as it has no speaker, but you can control playback of songs on your phone. Unfortunately, the Watch R does nothing more than offer basic playback controls (pause, previous/next song). There's also no gallery app to speak of and you can't watch videos on the watch (in case you wondered). 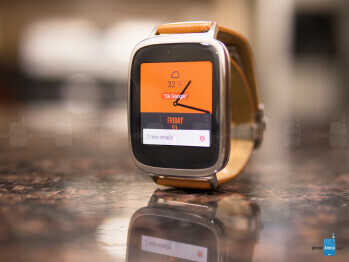 Unlike the Samsung Gear 2, which can hold calls thanks to its loudspeaker and microphone (even though they're still placed through your phone), the Asus ZenWatch, much like all the other Android Wear smartwatches, will only vibrate when your _phone_ is ringing. You can accept (or reject) a call on it, but that's about it – you'll still need to take out your _phone_ and take up the call on it. In other words, the ZenWatch mostly takes the role of ensuring that you're not missing calls. 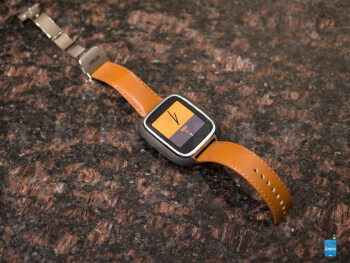 Battery life, of course, will vary depending on how you set up the ZenWatch. For those wishing to gain as much juice from its 360 mAh Li-polymer battery, you’ll want to set the always-on screen option of Android Wear to off – so that the display turns off completely once it times out. Going with this particular method, as opposed to the always-on mode, we’re able to get the usual one-day of normal usage from a full charge. In fact, we’re normally at around the 30% mark by the time we roll into bed. This achievement, obviously, is pretty much what we find with most Android Wear smartwatches so far. Therefore, it’s very much in that average category. Before we pass our final judgment, we have to remember the humble beginnings of early Android Wear smartwatches – they weren’t pretty, that’s for sure. With each new model coming to fruition, though, we’re constantly being impressed by the rapid improvement to their designs. 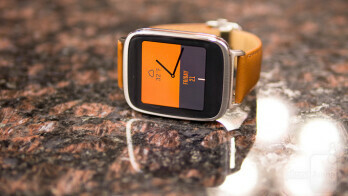 For a first stab at it, Asus comes to the tablet with an attractive and premium offering in the ZenWatch. Arguably, it’s the best looking one to date, possibly dethroning the Moto 360 if you have a penchant for square shaped watches. Considering that Android Wear’s functionality remains consistent between devices, there’s not much separating the ZenWatch from all the others that are in the mix at the moment. Yeah, it differentiates itself, similar to how its rivals do it, by providing us with new watch faces, a different approach to health/wellness, and the way it measures our heart rate. Superficially, however, we wouldn’t necessarily say it’s a step ahead in the experience. Visually, it’s a sophisticated looking thing that garners looks and questions from bystanders for its impressive construction and premium finish – the hallmarks of any memorable timepiece. However, we’re most satisfied by the $199 cost attached to it. That alone is impressive, seeing that it’s one of the most affordable smartwatches in the Android Wear space at the moment. Naturally, we don’t find any fault in picking it up if you’re adamant about buying one at the moment, but it’ll be interesting to see how its rivals are able to improve with their second-generation offerings.